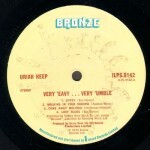 Uriah Heep “Very ‘Eavy… Very ‘Umble” (1970): a review by Igor Shveytser. There are many great albums in the history of hard rock music that were released in 1970. Some of them immediately became popular — among them “Deep Purple In Rock”, “Led Zeppelin III” and Black Sabbath’s “Paranoid”. Others were fully recognised much later — e.g. the Black Sabbath’s homonymous LP, Wishbone Ash, and UFO. The list of masterworks issued that year is endless. 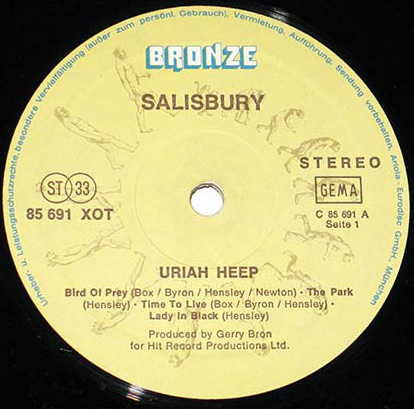 One of such pearls that was almost unnoticed by music fans upon its release (by ‘unnoticed’ I mean that the album did not chart that year) was Uriah Heep’s firstling. In contrast to many its ‘brothers-in-genre’, this album was released with different covers (and with even different content) on different continents. The European release was issued by Vertigo (the same label that released the first album of Black Sabbath). It is amazing that the American/Canadian version of the album (released by Mercury) was more heavy music-wise than its European ‘brother’, because it contained a hard rock number, “Bird Of Prey”, instead of bluesy “Lucy’s Blues”. But it actually was the American version that was labelled as “tenth rate Jethro Tull” by the American music critic, Melissa Mills (Rolling Stone magazine). There were many other harsh reviews, too, which is quite understandable if you take into account the nature of some music critics who tend to clown about music more than actually listen and appreciate it. There is no reason now, when more than 40 years passed since the release of “Very ‘Eavy… Very ‘Umble”, to argue that Melissa and Rolling Stone magazine were wrong. I am going to describe the high points of Uriah Heep’s debut album and try to find out why its fate was different than, for example, the one of Black Sabbath’s LP (which was very similar to Uriah Heep’s in terms of music content, as well as time and place of production). Let us listen to the music, analyse, argue, and also try to recreate the original format of the liner notes that were written by Ken Hensley presenting the band on the inner sleeve of the cover. It is amazing how quickly the band managed to progress from the quite common quartet, who worked in a somewhat ‘blurred’ music genre, a typical English music of the late ’60s, to the innovative quintet of the new style. And it was their own style of music: yes, it is hard rock as it is, with a touch of progressive rock. Not everyone admitted that: the aforementioned Melissa Mills wrote that “from the first note you know you don’t want to hear any more”. It is obvious that when Ken Hensley joined Spice and the band was renamed to Uriah Heep, the sound and the ‘ideology’ changed dramatically. “Gypsy” is based on a simple guitar riff starting with C minor, but the power and magic of these four chords are amazing. Ken is not credited as a co-writer* of “Gypsy”, but I can hear that he actually contributed to this song. This song is his triumph, but even more it is the triumph of Byron and Box, who ‘signed’ the music ‘cloth’ by the memorable riff and solo, as well as the story full of drama. 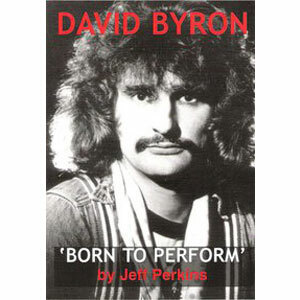 Later David Byron started to joke when presenting the song at the concerts, saying that it is a story about the girl “who can’t get laid”. But he did that to pretend that the band was not taking themselves too seriously. In contrast to Melissa Mills, a hard rock fan can easily hear from the very beginning of the “Very ‘Eavy…“ album that Uriah Heep is a remarkable band. Attentive ears can notice how the sound of “Gypsy” becomes heavier as the song progresses. “Gypsy” is an outstanding song — an invention, actually, and its immensity is not less than the one of its hard rock ‘agemates’ (“Speed King”, “Black Sabbath”, “Immigrant Song” etc.). Now, decades later, it is no question that “Gypsy” is a true masterpiece. Just a great song in E minor, with a characteristic mid-tempo guitar riff. Guitar parts are played in an interval that later became inherent to many progressive rock and heavy metal bands. It is not the ‘real’ Uriah Heep as we know them, but yet it is a first class hard rock with a touch of psychedelia. Instrumentation and harmony sequences suggest that the song was composed by Spice as a four-piece band. This American song in E minor is fantastic — it is a mixture of sorrow and light. Perhaps it is the best ballad ever recorded by Spice before Hensley joined them as a songwriter and musician. This song is the calling card of David Byron, and it also features mellotron, a wonderful instrument that brought so much warmth, comfort and emotion to the Western music of the early ’70s. By the way, it is amazing how productive Uriah Heep were at the time, writing their own material — and it was the material rich with beautiful songs. “Come Away Melinda”, being a great song, remained in their concert set not for too long (it was probably only in the Spice’s set list, abandoned later as the band became a five-piece). Same year another band, UFO, also recorded their version of “Come Away Melinda” — and it was a different song altogether. This version by Phil Mogg & Co is not worse than Uriah Heep’s: it is just not the ballad and not as beautiful as the one sang by David Byron. In fact it is a Heepy-blues, and it demonstrates their strong points as well as their weak ones. 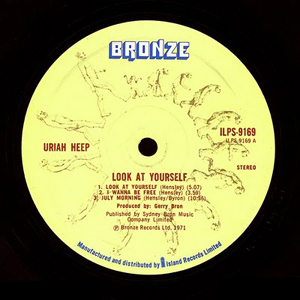 Uriah Heep played blues in a softer way (probably the word ‘humble’ is the correct one), a bit too conventionally, a bit ‘bookish’ — but yet the song is beautiful and intelligent. This blues standard in G major (labelled by Ken Hensley as ‘hardly unpredictable’ in his original liner notes for “Very ‘Eavy… Very ‘Umble”) was likely to be conceived during the jam session of the band that had just turned Uriah Heep. Ken’s playing is modest (though there’s a solo of his). Mick’s part is hardly recognisable. Only David’s part is outstanding — as always. “Lucy Blues” is a stark contrast to any of Uriah Heep’s hard rock number, be it “Gypsy” or “Bird Of Prey” (also in C minor). The latter was released on the American version of the album replacing… yes, “Lucy Blues”. “Bird Of Prey” sounds in a different way than the one that was included in the European release of Uriah Heep’s second album — this bird is not as full-fledged, so to speak. Still this song had a good chance of becoming a hit record, and it is very strange that it did not chart in 1970–71. The very fact that the current UH line-up still plays “Bird Of Prey” proves that it is a true classic. This outstanding song that opens the side B of the album was written by Paul Newton — and probably he wrote it before the band became a five-piece. “Dreammare” is rather the quintessence of the early Uriah Heep’s music (though it is not as lyrical as other songs). But you can hear that it is Uriah Heep, not any other band: a wide and noisy riff, vocal polyphony, each of two guitars plays a solo (Ken’s slide guitar is very noticeable, it fills all the gaps), let alone psychedelic (and a bit crazy) lyrics. There is a feeling of pleasant but total craziness, so to speak. This song is the landmark — a milestone that demonstrates the real Uriah Heep to come in the next two years! Hard rock-style shuffle in A major. Probably one of the first double guitar solos in the history of hard rock music. Lyrics and harmonies are typical blues rock in major with a touch of not-so-bluesy (harmony-wise) modulation in the chorus. There is something progressive and hard in this song. One can suppose that the song ‘base’ was there before Ken Hensley joined the band. Dark mood of this song in G minor brings a feeling of progressive rock, and this feeling becomes even more distinguished as the song progresses towards the final sequence. “I’ll keep on trying” demonstrates the variety of UH’s ‘faces’ that they had in the early days. In this particular case it is clear that the song was composed not by Spice but by Uriah Heep. Sometimes I think that this very variety of music was perceived by the critics as the lack of originality, as an effort to copy other bands. The song is fantastic. A ‘viscous’ riff, the guitar and bass parts that obviously later influenced the new wave of British heavy metal bands, the feeling of real dramatism in the verse — and the way the song resolves into the bright sequence in major, with David singing “Well I remember ev’rythin’…” And then the high-strung and deep-felt guitar solo by Mick Box, and the progressive rock coda. This song starts with Fm7 chord and evolves through jazz-rock progressions — and there is a reason to think over for those believing that only the ‘classic’ UH line-up’s rhythm section (i.e. Gary Thain and Lee Kerslake) was the best. Paul Newton and Alex Napier were great musicians, too, and in this song (as well as in the previous one) they clearly show their skills. Obviously the line-up changes were later made for non-musical reasons. I am not saying that one rhythm section is superior than the other. I only want to emphasise the highest quality of them both. And, by the way, it is another great song written without Ken, though later he commented** “Wake Up” as if he took part in writing it. But it is not likely: harmonies and instrumentation are quite Spice-style. Also this song is an ‘audio monument’ of David Byron as a drama actor/singer. He was able to go the complicated imaginary path from the whimsical gypsy opera-style (“…said a young man before he died”) to the lyrism of the final phrases that repeat the first ones. This ability was not inherent to every vocalist, even to famous ones. Byron was over-talented, and from the first album he managed to show his art in full bloom. P.S. 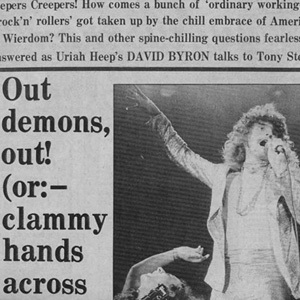 If I was asked to choose the main hero of Uriah Heep’s first album, I would choose David Byron, whose cobwebby face was featured on the cover of the European release. Still he was equal to the best. It is also important to mention Gerry Bron and Peter Gallen who managed to achieve the powerful sound (unfortunately, re-issues often sound less impressive that the original LP, being less detailed and more booming). The album itself hardly claimed to be a smash-hit, just because that particular year was rich with brilliant new releases. The aforementioned Black Sabbath’s debut album was great but not superior in the musical sense: it was as eclectic as Uriah Heep’s, but its strong points were innovation and rebelliousness. And it was released earlier that “Very ‘Eavy… Very ‘Umble” — in February, not in June (when music fans leave cities). By the way, music critics wrote harsh reviews about Black Sabbath’s debut, too. 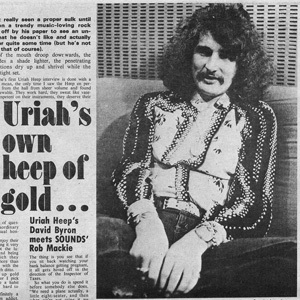 Uriah Heep was compared to Jethro Tull, and Black Sabbath to Cream — and both debutants were considered being ‘worse’ than the bands they were compared to. It is really a shame that some critics actually listen with half an ear and understand with half a brain (or less). And those who look up to those critics are real disaster. The same fate was destined for many other Uriah Heep’s contemporaries. Uriah Heep did not seem to be real rebels. Neither they looked like a pop group in a sense we are familiar with. But from the very beginning they put themselves on the map of rock music, and they did it by their own signature, which was wide and original. As time passed by, their debut album became appreciated, and the current statistics are that the sales of “Very ‘Eavy… Very ‘Umble” exceed half a million copies (and half of this amount in the USA, the motherland of Melissa Mills). Not too bad for London guys who played maybe not too heavy, but really not too humble. * Ken Hensley was credited for the first time as a co-writer of “Gypsy” on his “Blood On The Highway” album (2007). ** See Ken Hensley’s comments on 2002 re-issue CD.